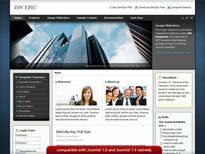 JoomlaShine have released a new theme for Joomla 1.0 and 1.5 and you can see it in action here. Like all new theme providers I haven't always gotten round to playing with the theme or checking out the community but on the face of things this is very nice and it's not very expensive. I'm not knocking the clubs here, as I love them and the clubs know this, but it's also nice to have a theme provider that you can just buy a single theme from. Anyway, I've not used the blurb these guys sent through, because this needed a little moment of my very expensive time. I'm going back to the blonde. Click here for a demo, more info or to buy this theme.